Wow my Christmas tree bunting pattern seems to be very popular! Thank you so much for having a look at it (and for that matter, having a look at my blog ramblings in general), I've had some lovely feedback from fellow hookers on Ravelry and Facebook. 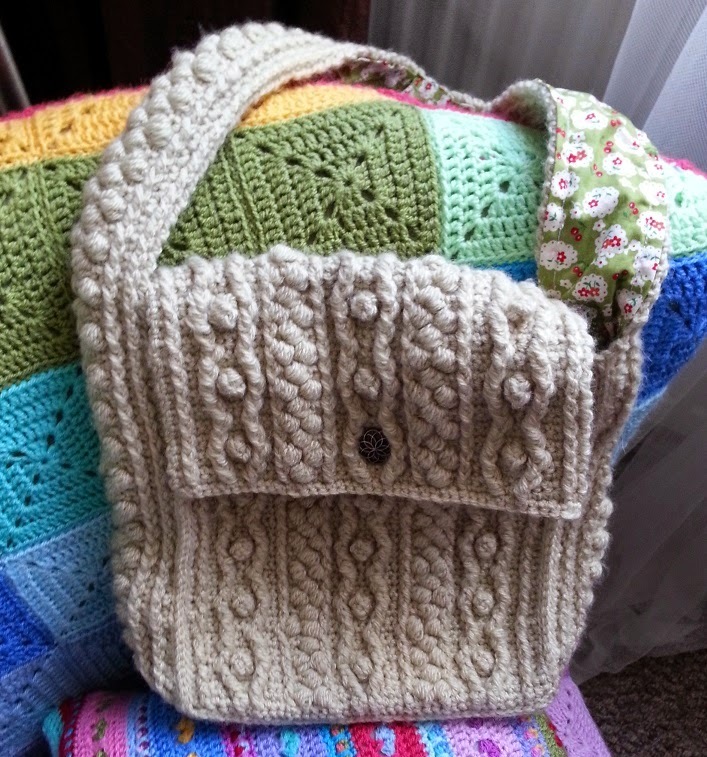 It's fantastic to see your pictures if you have tried out one of my patterns so please keep sending them to me. I'm very fond of these Christmas trees, they are so quick and simple to do and I love simplicity in a design. 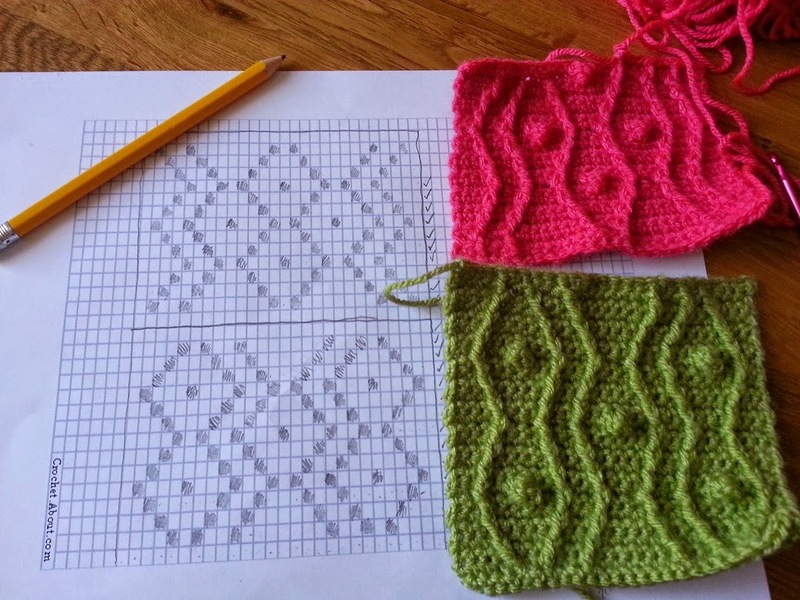 For one, it makes remembering the pattern very easy so you can pick it up whenever you get a spare moment and secondly, I find it very satisfying to have all the numbers work out, no fear of having missed a stitch or missed a row - it all just makes sense and works with no bother. That said, I have perhaps gone the other way with what I am playing around with today, cabling! I wouldn't know where to start with cabling in knitting. 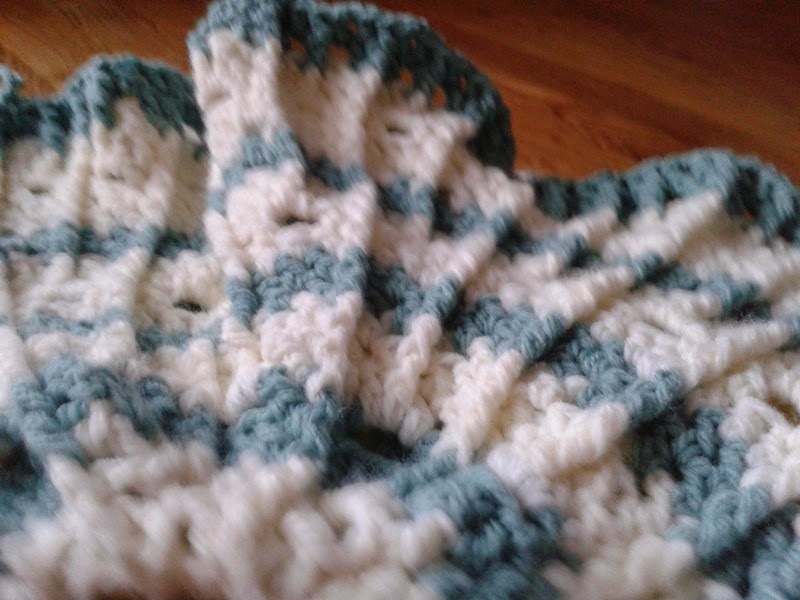 Strictly speaking I suppose what I am calling cabling in crochet should be called 'cabling effect' as it uses Front and Back Post trebles to get a kind of ridge effect. My first go at doing anything like this was at about this time last year when I found a pattern on line for a tote bag. 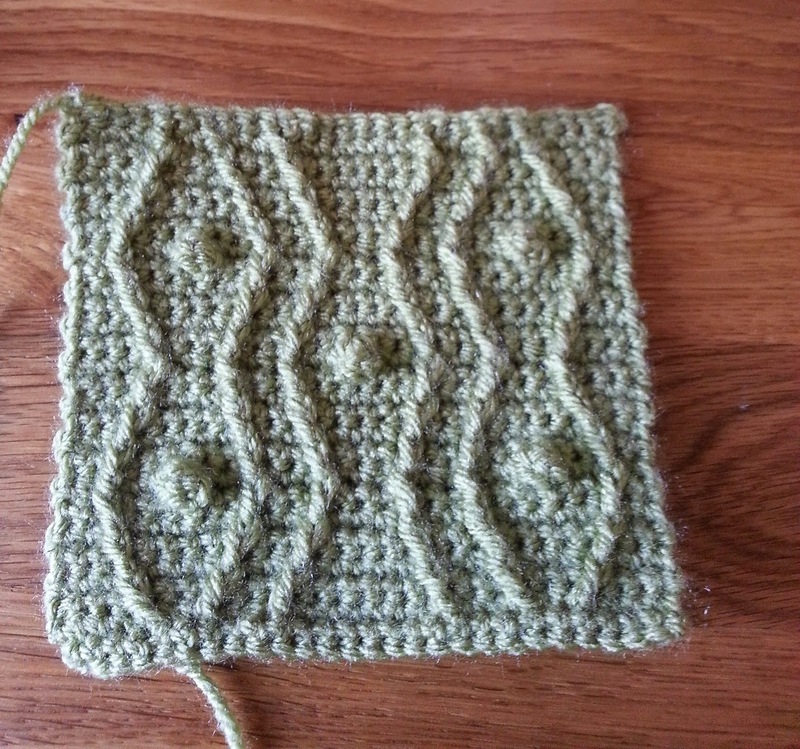 I really struggled to get to grips with the pattern and must have had three or four attempts at the first few rows before I really got the hang of it. The stitches themselves are fairly straightforward but knowing where to put my hook for the next stitch baffled me at first. 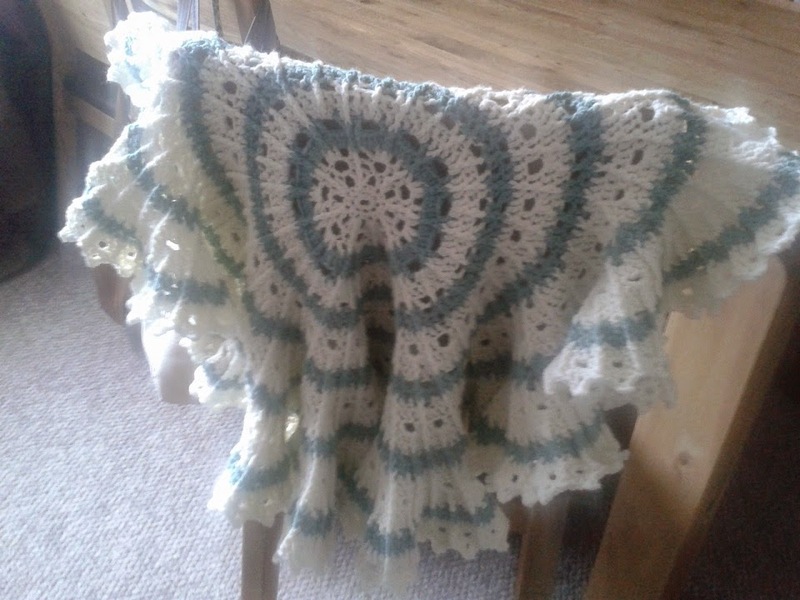 For those of you who don't know how to do front and back post crochet I will try to explain it as best I can. 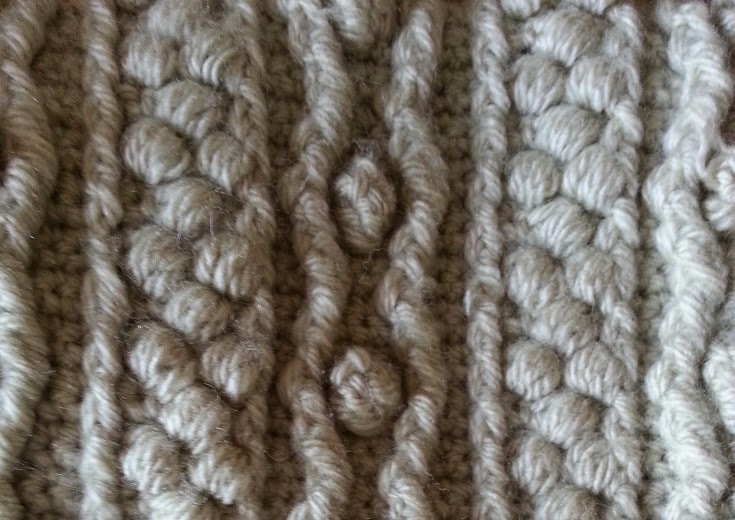 It is simply a normal stitch (usually a treble crochet stitch - double crochet if you are in the US) but instead of making it in the top of the stitch where you normally would you make it around the post of the stitch instead, so you put your hook around the little bar - or post, that the stitch has made. So this bag pattern was probably the most challenging pattern I had tried up to that point and I got more than a little frustrated with myself that I couldn't work it out. I now know why I struggled so much at first, it was that first row! 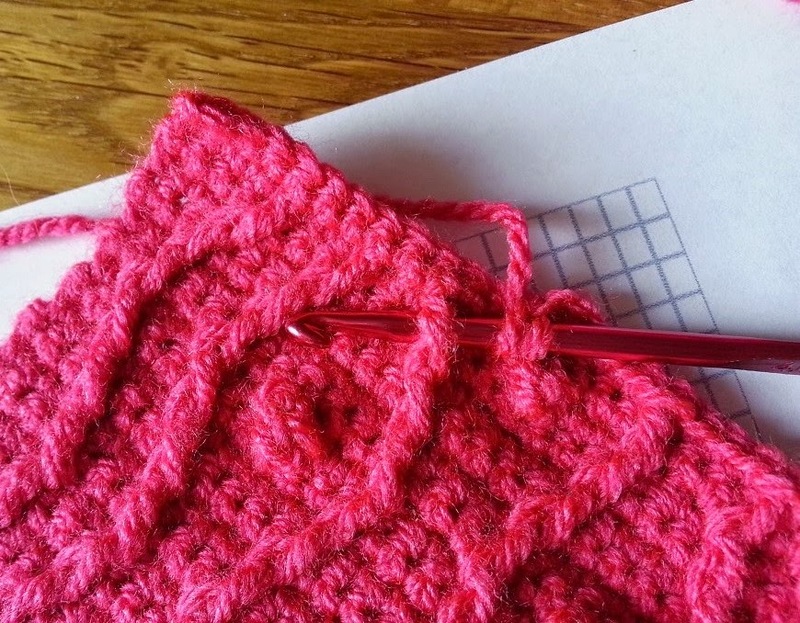 It is so hard to see where you have made your 'special' stitches on that first row and I hadn't learnt to just count and trust the pattern - I wanted to see where I was making the next stitch, not just go by the numbers. I got there in the end with that pattern and it just took a few rows for it all to click into place. The reason for that being that the numbers all worked beautifully, nice repeats, no bodging but everything fitting just as it should. I've wanted to do something similar to the bag for some time now and with nothing much else on the go, I printed off some graph paper this morning and drew out a couple of cable designs. It seemed like the easiest way to get the numbers to work and made it easy to visualise what the pattern would look like.